Once the Declaration of Independence had been issued, the Second Continental Congress largely turned its attention to fighting and funding the Revolutionary War. As part of these tasks, as well as an additional expression of the 13 Colonies' independence from the British Crown, an issue of coinage was sought that would help prop up the Continental Notes being used to fund the war effort. 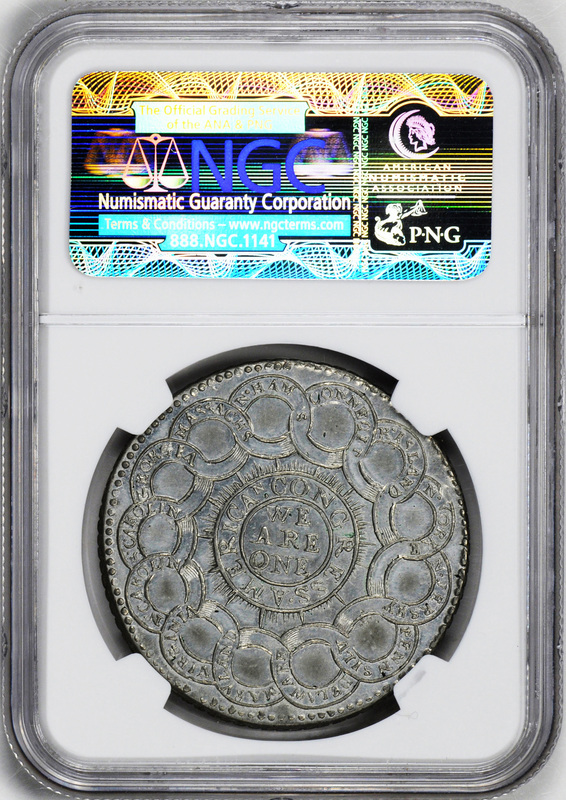 Unfortunately, the new nation had a problem - it lacked a sufficient supply of silver bullion to use in striking coins for circulation. To remedy this problem, the Continental Congress received promise of a loan of silver bullion from one of its few allies in the struggle to break free of the British Empire: France. Unfortunately, this loan failed to materialize and France's most significant contribution to the American effort during the Revolution would have to wait until 1781. In that year, a powerful naval force under command of the Comte de Grasse defeated a British fleet in the Battle of the Chesapeake and blockaded Yorktown, Virginia long enough for Washington to secure the surrender of General the Lord Cornwallis. 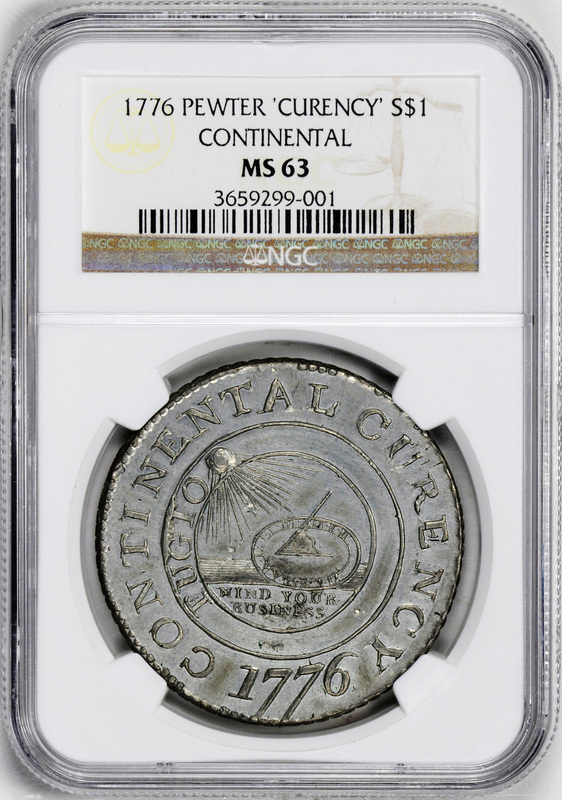 In 1776, however, these events were still in the future, and the Continental Congress proceeded with its plans to issue coins using silver bullion promised from France. Accordingly, Congressional agents commissioned the New Jersey engraver Elisha Gallaudet to prepare dies for a delivery of coins in various denominations. 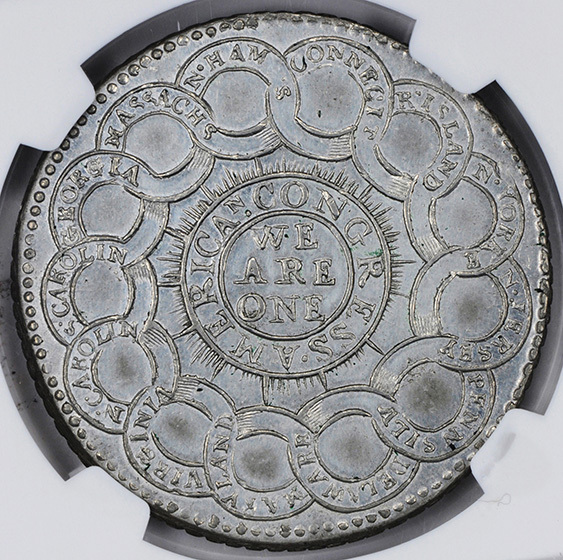 All of the dies were the same size, however, and Congress may have intended to base the denominations on the use of different coinage metals. (Those pieces struck in silver were probably going to serve a purpose in commercial channels similar to the later Silver Dollars struck in the United States Mint.) Gallaudet complied with the request and prepared a design at last partially based on earlier sketches attributed to Benjamin Franklin. The obverse exhibits the inscription CONTINENTAL CURENCY (CURRENCY or CURRENCEY) and the date 1776 around a sundial rebus with the words FUGIO and MIND YOUR BUSINESS. This last feature was a well-known merchants' saying tht translates as "Usable Time Flies, Therefore Mind Your Business." On the reverse, 13 conjoined links encircle the periphery, each of which is inscribed with the name of one of the colonies. In the center a glosy or rays emanates from a circles inscribed AMERICAN CONGRESS and WE ARE ONE. Due to a spacing problem during the engraving process, the first obverse die(s) feature only a single R in the word CURENCY on the obverse. Gallaudet later corrected this, creating the variety with the proper spelling of CURRENCY. Although the French bullion failed to materialize, examples of the CURRENCY variety were struck in tin (often mistakenly referred to as pewter) and, to a much lesser extent, brass. 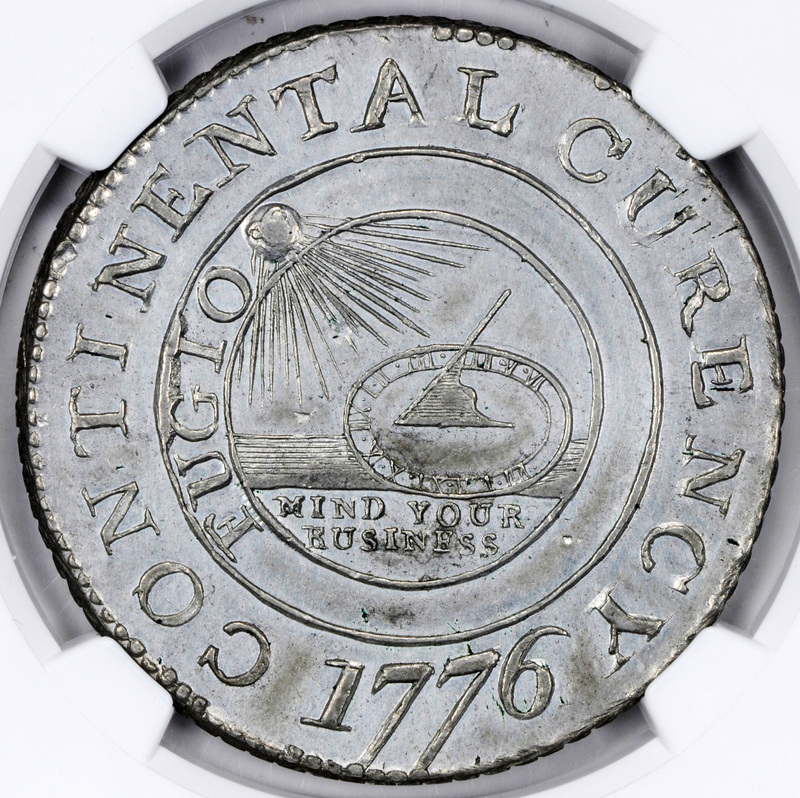 It is not known whether the tin pieces were intended as patterns for the proposed silver strikings or whether the Continental Congress envisioned these coins serving as a distinct denomination. Regardless, the entire project was eventually dropped in the absence of the silver bullion, and all that remain are survivors from limited press runs. Many tin pieces encountered in today's market are worn to one degree or another, which suggests that the issue may have seen actual use in circulation. If so, at what value the pieces traded has been lost to history.